Cannabis Plants >> The Green Hart Health & Wellness Inc.
How Are Cannabis Plants Different? With over 85 cannabinoids and more than 100 terpenoids identified through many different strains, Cannabis Plants are very diverse in their effects and medical benefits. Indicias are generally associated with relaxation, whereas Sativa’s are generally associated with a more cerebral sensation. Hybrids are a mix of Indica, Sativa and sometimes Ruderalis plants. Some strains will not share the typical effects that their names carry. A Sativa could have an Indica type of effect or an Indica could have a Sativa type effect, depending on the cannabinoids and terpenoids. However, there are certain traits that are generally associated with each plant. Here’s a quick rundown on these types of Cannabis Plants. Indica plants generally grow to between 2 and 4 feet tall and have wider leaves and shorter branches than a Sativa plant. Some of the medical benefits generally associated with Indica can include; relief of migraines, muscle spasms and body pain, anxiety or stress and can be helpful in treating insomnia. Sativa plants will grow much taller than the Indica plant (around 20 feet tall), have slim leaves and branches, and are generally a lighter shade of green. Some of the medical benefits of Sativa can include; treating depression, ADD, mood disorders and fatigue. A hybrid strain is a cross of both Indica and Sativa plants. Indica and Sativa strains can have different medicinal properties, so combining the two allows for new strains that are targeted at more specific ailments. Hybrids can be Indica Dominant, Sativa Dominant or a 50/50 mix of the two. The Cannabis Ruderalis plant is very low in THC but high in CBD and are not as frequently used for medicinal purposes. Ruderalis plants will generally only grow to about 2 feet in height and do not require a light cycle for flowering. 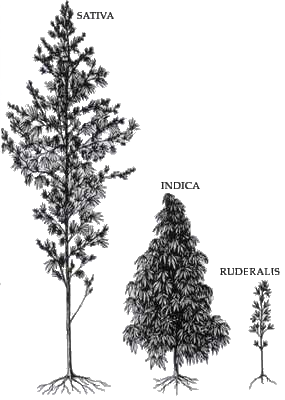 Ruderalis plants are often bred with other types of Cannabis for their resistance to disease and insects, and auto-flowering properties. Was this helpful? Leave all of your questions about cannabis plants in the comment below.